An account of one of the most consequential natural disasters of modern times. Molesky’s narrative flags in some sections, such as in the early chapters tracing the history of the Iberian Peninsula from antiquity to the early modern age, or the attempt to reconcile reports of the final death toll. But these sections are few and far between, and overall, Molesky’s attention to detail only serves to bolster his narrative. Though the impressively learned author weaves science and intellectual history into his account, his discussion of the quake’s impact on Enlightenment thought — Voltaire and Kant grappled with its cosmic meanings — is tucked away at book’s end and feels slightly cursory. But Molesky excels in his sections on the material impact from the three disasters and the plight of the city’s residents — lisboetas — from all classes. Molesky’s gripping portrait of the destruction and carnage—and the concurrent rise of one of 18th-century dictator the Marques de Pombal—is gleaned from a seemingly endless number of firsthand accounts. His tale is a welcome resurrection of an epic tragedy that captured the imaginations of thinkers including Voltaire, Rousseau, and Kant. 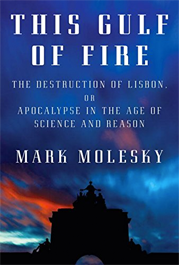 What did you think of This Gulf of Fire: The Destruction of Lisbon, or Apocalypse in the Age of Science and Reason?